Christopher Charles Jacobs was born September 25, 1964 in Livingston. Long and lean with powerful legs, Chris distinguished himself as a swimming prodigy as a pre-teen, particularly in the backstroke. He began working with coach Tom Weltchek at the age of 12. Weltchek turned him into a dominant freestyle swimmer. Chris continued to train and develop through junior high school, despite experimenting with drugs. Heading into 9th grade, his parents decided to remove him from public school and enrolled him in Newark Academy (which is located in Livingston). Chris regularly set national records in his age group and was a 12-time Prep All-American. He earned a scholarship to the University of Texas. It was in Austin that his drug use and drinking got out of control, in part because of chronic pain in his shoulders, which prevented him from training more than a few weeks at a time. By his junior year Chris had dropped out if UT and quit swimming. Deeply depressed, he bought a handgun and came close to committing suicide. Eddie Reese, the Texas swimming coach, alerted Chris’s parents about his rapidly declining mental state. They brought him back to New Jersey and entered him into a rehab program at Fair Oaks Hospital in Summit. In 1987 Chris returned to school drug- and alcohol-free and resumed his competitive swimming career. Within a year, he had rebuilt his body and was second only to Matt Biondi in the 100-meter freestyle. 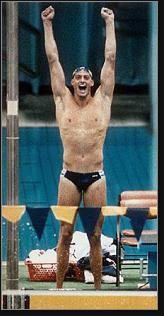 Chris made the 1988 Olympic team and swam the first leg of both the 4 x 100 freestyle and medley relays. The U.S. teams set world records and won gold medals in both events. Chris set an Olympic record in the 100-meter freestyle during qualifying, but had to settle for silver in the final, finishing a half-second behind Biondi, who set an new Olympic mark. Upon his return to the U.S., Chris stopped in Hawaii to get a tattoo of the Olympic rings, which started something of a tradition among American Olympians. Chris concluded his competitive swimming career, finished school and did some traveling before becoming a trader on Wall Street with J.P. Morgan Chase. He is a longtime supporters and board member of Swim Across America, which unites the swim community in fundraising for cancer research.